Three weeks ago I started getting calls from police and friends in the city where my parents live. Without going into too much detail, my parents were very not-well, and their house had become unlivable to the point that I had to bring them up to Indy to live with me. 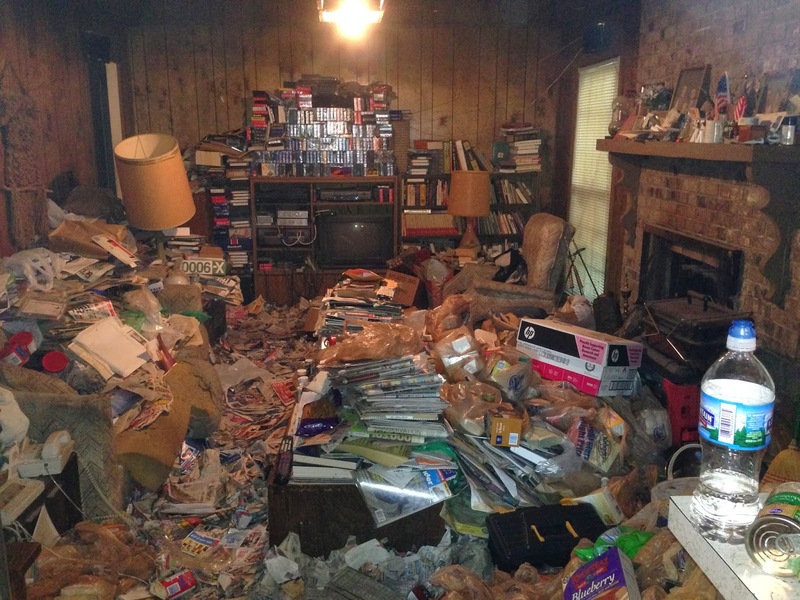 If you've seen the show "Hoarders", you'll know how they were living. I got a sinus infection on my first trip down to get them, and now I won't enter the house I grew up in without wearing a respirator. The dust and mold are that bad. This is one of the cleaner rooms in the old house. So I'm currently spending 98% of my time taking care of them AND my 3 boys. Which involves full meals, help with meds, going over their financials in detail, finding them long-term assisted care, arranging the cleanup/sale of TWO houses, and generally just paying attention to their day-to-day condition in a way nobody has for years. Every other day I discover some new problem they've been hiding/ignoring that requires a new trip to the doctor. This is on top of my wife's health problems, and my own. In short, 3 of the 4 adults in the house are going to have surgery before the end of the year. Amidst everything else we have to do. So at the end of the day, I get maybe 1/2 hour to myself. My one night out a week to game is now spent playing X-Wing, because I can just buy the ships and use them without having to assemble/paint anything first, and there's always someone willing to play it at the store. My enthusiasm for WarStrike has not diminished, and I will be working on the rules when I can, health/sanity permitting. But I have to be honest and admit that I'm going to be too busy to do much on it until probably February or March of next year.